Thanks for printing! Don't forget to come back to The Home Fix-It Page by Dave Baker for fresh articles! Is your fireplace ready for the heat? 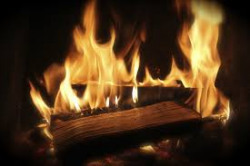 Q – How do I know if my fireplace is ready for action? A – With one round of cold weather already behind us and another coming soon, it’s not the most pro-active time to get your fireplace ready for burning. However, if the first cold weather caught you off guard, then now is the perfect time. Have a certified chimney sweep come and sweep out your chimney after every cord of wood burned and especially at the beginning of each burning season. A good sweep can also do a chimney inspection to see if yours has sustained any damage to its major parts: the chimney cap, the flue lining, outside mortar, and the damper. Trees. Branches from nearby trees should be no closer than 15’ from your chimney. Trim them back every season. Clean soot from the hearth and fireplace area. Warm, soapy water and a brush should do the trick. Don’t be fooled into thinking that you don’t need a chimney sweep because you ‘burn aluminum cans’ or ‘creosote cleaning logs’ in your fireplace. While they may soften the creosote in the flue, those products do not clean it away. Nothing says lovin’ like a snuggly night in front of the fireplace. Make sure yours is up to snuff and ready for what could be a colder than normal winter. Sign up for Dave Baker's Newsletter! Contact Dave with questions or to discuss your next project. If you are a company and would like to advertise on this site, please visit Advertise with Us. Enroll In The Home Fix-It Page Newsletter. Enroll in the Home Fix-It Page Newsletter. Don't worry, your information is safe with us. © 2019 The Home Fix-It Page by Dave Baker. All Rights Reserved.